Premium 5" GPS Navigation: Magellan introduces the all new RoadMate 5250T-LM. This premium 5" gps navigator comes loaded with high end features to make navigation safer and easier. And, with Free Lifetime Map Updates (up to 4 times per year) and Free Lifetime Traffic Alerts, you'll always leave home armed with the latest information to help take the stress out of your drive. 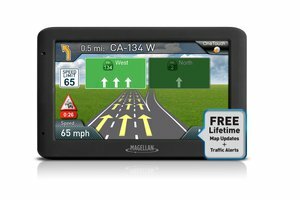 Free Lifetime Map Updates: Download the latest map information (up to 4 times a year) for the life of your Magellan RoadMate navigator. Free Lifetime Traffic Updates: Real-time, subscription-free traffic updates sent directly to your GPS unit to avoid traffic jams and other delays. Portrait Mode: Portrait Mode provides an extended view of the road ahead. This is a factory reconditioned / refurbished item.